Here's my latest Mood Board Design below! The goal was to work around the clients existing and very expensive gold silk custom window panels. 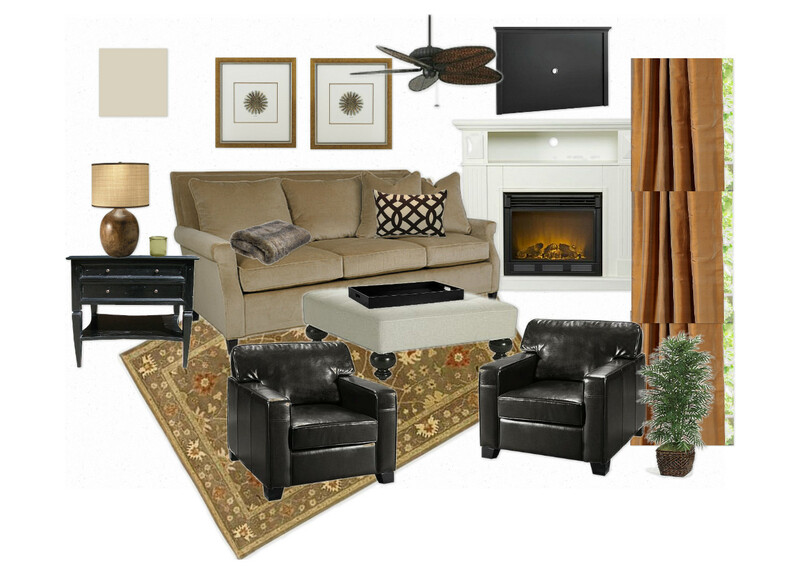 So I balanced the space with grays, neutrals, and an olive Persian rug...a color the client loves. Simple contrast between dark browns and cool grays adds interest to a once flat space with too many warm colors. This design isn't set in stone. For example those club chairs below will be switched out for comfortable recliners per the clients request. But the board gives the client a vision of what we can do. A few affordable pieces in this room...the ottoman is $299 from West Elm. The club chairs are from Home Decorators for just $299 each. Every room I design usually has a splurge. Here it's this sofa from Layla Grace priced at $2,700. Okay I'm off to another Design Consultation this morning...have I mentioned how much I love my job? Beautiful! I can see why you love you job!! Where did you get the pieces? I love the rug and ottoman! Laura, there are some high end pieces in this room. For example the couch is from Layla Grace at around $2700. However the ottoman is from West Elm at $299. And the club chairs are from Home Decorators again for just $299 each. This is my philosophy when decorating for less....mixing a few affordable finds with a few high end pieces.